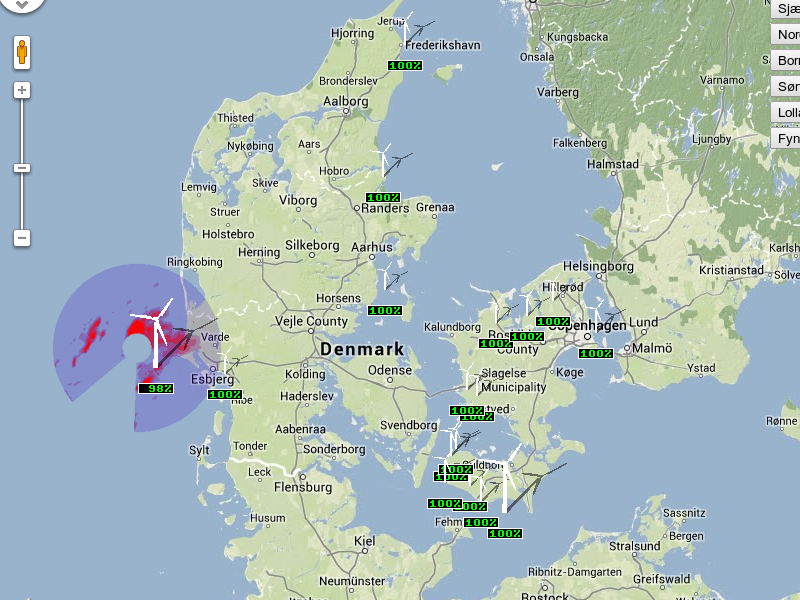 Today WWPT is one of the most used tools for wind power forecasting worldwide. The software is used by all major players in the Danish Power system, where more that 33 pct of the electricity load in 2013 was covered by wind power production. In December 2013 more that 53 pct of the total power load was covered by wind. As of today the software is used for wind power forecasting and integration in North America, Europe (many countries), Asia, and Australia. The picture below shows a toy wind power prediction system (and not the full WPPT software tool). By clicking on the radar image disc at Horns Rev, it is also possible to see the evolution of weather fronts around the wind farm. This relates to one of the exciting projects we work on in Denmark, Radar@Sea, where we concentrate on demonstrating the benefits from on-site installation of weather radars at offshore wind farms, in terms of predictability and control. … but here is a link to the current power flow right now.